"A return to form." "A reinvention." There are lots of clichés we fall back on when describing a fresh game in a long-running series. The truth is, Nintendo has constantly reinvented the idea of a 3D Mario game, relentlessly pushing the franchise forward with each release. Super Mario Odyssey is just one more step in the right direction, another evolution of a perfect formula. The setup in Odyssey is as familiar as ever: Bowser has kidnapped Princess Peach, so you need to collect an arbitrary item (Power Moons rather than Stars this time) and chase him down to save the day. This time around, Bowser is going from kingdom to kingdom collecting items -- a ring, a gown and so on -- for a wedding ceremony. It's a coherent enough narrative, but the joy of Mario has never been in its story. The structure is essentially a combination of Super Mario 64 and Galaxy. 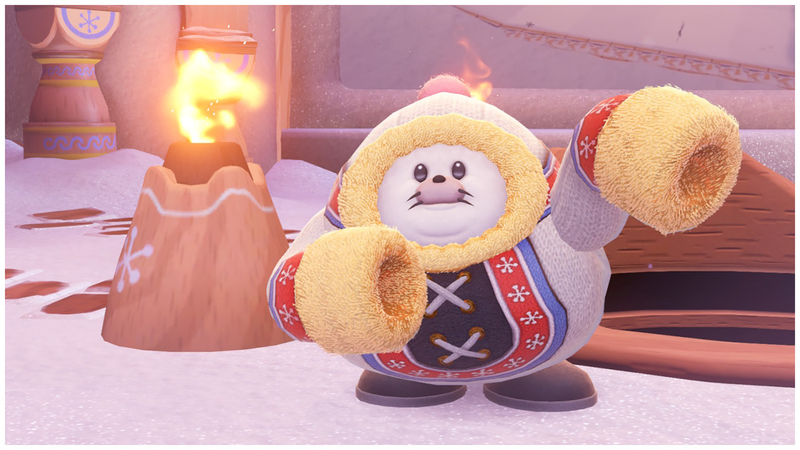 There are hundreds of Moons dotted around more than a dozen kingdoms, some nestled in hard-to-reach and hidden locations, others handed out for defeating bosses or winning races. Just as Galaxy's spaceship would only advance after you collect a certain number of Lumas, Odyssey's Moons power up an airship that will fly you to new kingdoms. There are certain things you know you're getting with a Mario game. It almost goes without saying that Odyssey offers tight controls, creative platforming and gorgeous art with near-perfect levels of polish. But every Mario has a twist. Sunshine has the water pack, Galaxy has space, 3D World has multiplayer score chasing. Odyssey's is a hat. At the start of the game, as Princess Peach is kidnapped, Mario's famous hat is shredded. Luckily, he soon meets a character called Cappy, whose regular appearance is a cross between a Boo and a top hat. Cappy's sister, Tiara, has been kidnapped to act as a headdress for the ceremony. The pair quickly resolve to join forces to stop Bowser from wreaking his personal brand of comic mischief and mild havoc. Cappy has a single talent: He can be thrown. But that one move opens up a world of possibilities. You can throw Cappy with the X button and use him to grab coins and hit certain enemies. Hold X and Cappy will hover in place, ready to be used to jump over gaps or as a springboard to reach high platforms. (If you run into Cappy, Mario jumps roughly as high as with a backward or sideways somersault.) This alone makes platforming challenges far more dynamic and interesting: Where before you would simply long jump and somersault around a level, now there are multiple approaches to any obstacle. The real fun starts when you use Cappy to "capture" enemies and objects, which grants you full control over them. Many Mario favorites can be possessed in this way, just by throwing Cappy at them. Goombas can shuffle around and stack themselves on top of one another to reach high places; Cheep Cheeps allow Mario to swim freely underwater; Lakitu will let you fish; Fire and Hammer Bros. grant you huge jumps and their respective projectiles. 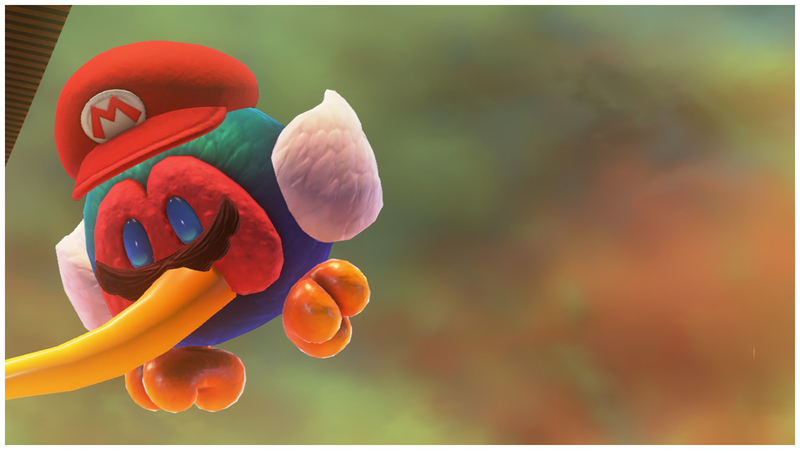 At its core, Cappy is a replacement for the power-ups of every Mario game, but Nintendo takes the system to weird and wonderful places. Within a few hours, you'll have controlled a T. rex, a tank, a fork, an RC car, a lava bubble and ... a slab of meat. Each of these possessions brings new mechanics, and there are dozens of characters you can control. Some, such as the Goombas, are ubiquitous, while others appear in just one kingdom or even a single sequence. Just as using Cappy to jump allows for more divergent platforming sequences, the capture system gives rise to ceaseless variety in gameplay. I played the vast majority of Odyssey in portable mode, maybe eight hours docked with a Pro Controller and a couple more with Joy-Cons in each hand. The Joy-Con controls were fine: There are lots of motion-control options, particularly when throwing Cappy or controlling foes, but I always found the button-press alternatives more intuitive. I'm not a huge fan of the Pro Controller, as I tend to use the Switch as a portable, but it's definitely the most comfortable way to play in front of a TV. I also briefly tested the two-player mode. It's an asynchronous affair, with one player controlling Mario and the other Cappy. It's certainly useful for playing with very young children, but those coming from the superb multiplayer of 3D World aren't going to be blown away. If you're desperate to play with friends, you're probably better off just passing the pad between Moons. My friends and I used to reference "Resident Evil logic," which was the notion that people always seem to leave caches of ammo or herbs down dead-end corridors. The core tenet there is if you stray away from the beaten path, you'll be rewarded. That idea is everywhere in modern gaming, often with collectible items as the prize. Most recently, Nintendo used the concept to encourage wayfinding in The Legend of Zelda: Breath of the Wild. 3D Mario games have always done this to an extent -- many of the stars in 64 or Lumas in Galaxy were squeezed into forgotten corners of their respective games. They reward inquisitiveness and prompt players to embrace exploration. Every kingdom is like a rabbit warren, full of secrets and unique trials. You'll probably stumble upon your first hidden Moon or bevy of coins entirely by accident. For me, "I wonder what's up there?" gave way to "Well, how do I get up there?" which, after a couple minutes of problem solving, led to, "Oh, a Moon!" In Odyssey, that observation-investigation reward loop drives the whole game forward. Every kingdom is like a rabbit warren, full of secrets and unique trials. In five minutes of gameplay, you might waddle about stacking Goombas before flying around as a Bullet Bill and then head down a pipe for some 2D platforming. 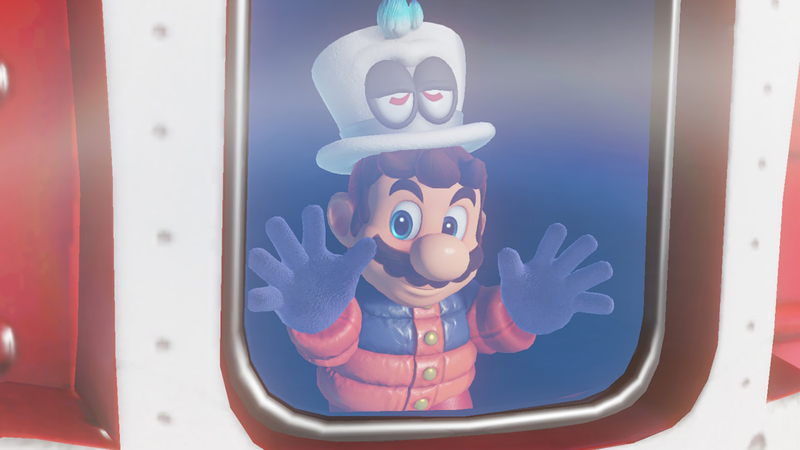 But despite this occasionally frantic pacing, Odyssey never descends into a mini-game compendium, thanks in part to the Cappy conceit keeping you in control of proceedings. A quick word about those well-publicized 2D-platforming levels: Nintendo has clearly borrowed from the creativity of Super Mario Maker, integrating many new ideas into the format. Some levels look graphically interesting, with 2D planes that wrap around a cylinder, while others mess with gravity or even require you to follow a backdrop or "fall out" of the 2D world and into the 3D one. 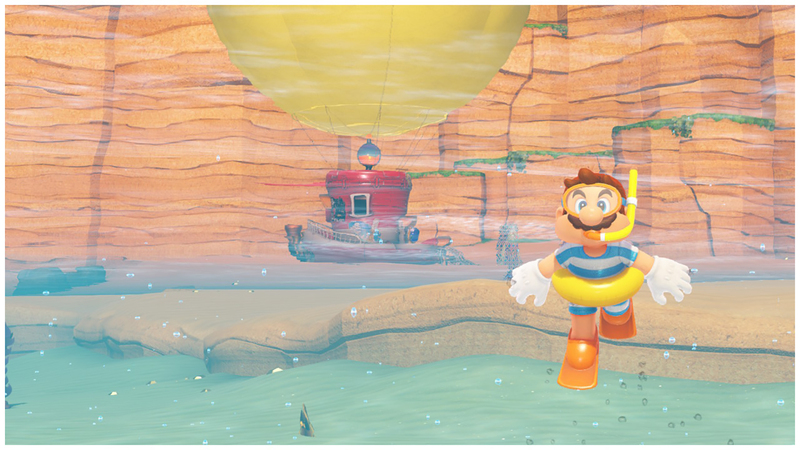 The spirit of exploration from the main game is also present here, with Moons hidden offscreen or behind drops that would usually mean death for Mario. These levels are great set pieces, with the New Donk City sequence being particularly memorable. I'm really hoping we get a new Super Mario Maker soon. While it doesn't stray too far from the established Mario formula, there are a number of additions that make Odyssey feel like a more modern game than we typically see from Nintendo. Perhaps the most notable addition is a proper map system with fast traveling. Kingdom maps are beautifully put together in a travel-guide format. This not only helps you find your way but also facilitates travel between checkpoints in seconds rather than running the length of a level. Getting to any particular spot in the game (after you've unlocked everything) shouldn't take longer than a minute, which makes mopping up Moons way less of a chore. Coins are now actually used as currency. You can use them to buy clothes and other items, and each kingdom also has 100 unique coins that can be used on outfits, stickers and collectables specific to that region. The outfits are a lot of fun: You can select your hat and outfit independently, which has been hilarious to the kids I've shown it to. Most collectables live inside your airship, so by the time you're finished it'll look like a Mario gift shop. Stickers are actually applied to the outside of the airship, a little like the luggage stickers of old, which vibes well with the travel-guide maps and a lot of the end-game dialog. The modernization continues with the addition of a decent-enough photo mode, which lets you pause the action and move the camera around to capture images. The graphics quality seems to increase a little when you're in this mode. I think the render resolution is the same, but to my untrained eye the draw distance is improved and there's some anti-aliasing added on top to smooth out the edges a little. Beyond that, there are a few fun filters, along with an option to add a logo. It's not on the level of games like Uncharted 4 or anything that supports NVIDIA's Ansel, but it's a solid feature. Another welcome feature is minigame leaderboards. Nintendo is clearly held to a different standard when it comes to online functionality, as its efforts have been so hit or miss. For it to have a functional online leaderboard with settings for filtering global and friends' scores, just for a collection of side content, at least shows it's moving in the right direction. Also, it was enjoyable briefly being third worldwide for something. I'm sure by the time you read this I'll be a few million spots lower. While we're on the subject of moving with the times, there's Princess Peach. Yes, Nintendo is still leaning on the kidnapped cliché, but without spoiling things, she at least has one scene where she's given some agency in this game. Super Mario Odyssey's main story is short. I wasn't rushing through it, but I arrived at the end credits in around eight hours. I was a little concerned when I reached this point -- I wasn't ready to call it a day, and we've all seen developers put together a great short game only to be slammed by The Internet for not padding it out with hours of tedium. The Mushroom Kingdom is stuffed full of Easter eggs and fan-favorite characters. If you can avoid social media until you've had the chance to explore it, you should. Luckily, both my fears and disappointment were short lived. After the credits finish rolling, you soon unlock a new area, which contains more to do than any other world in the game. Hundreds of new Moons are also added to places you've already visited, and extra challenges like races appear on each kingdom map. These segmented trials are perfect for when you have five minutes to burn, which naturally leans into the Switch's strengths as a portable device. After around 30 hours of playtime, I've now collected 330 Moons, which is less than half of the 800 in the game. Even though I know at least one other reviewer who's approaching 800 Moons and I've definitely been taking it easy, I can happily report that Odyssey should last you weeks and months rather than days. I'm not one to complain about game lengths -- I actively avoid longer games because I worry I'll never find time to complete them. But Odyssey's end game is extremely pleasing, and this is one game I'm definitely going to finish. Whether they're at the end of a tricky challenge or just a reward for following your instincts, hunting down new Moons is an enjoyable task. Because you can zip around worlds and checkpoints so quickly, these segmented trials are perfect for when you have five minutes to burn, which naturally leans into the Switch's strengths as a portable device. Super Mario Odyssey is not the departure from the norm that Breath of the Wild represented for the Zelda series, but it didn't need to be. Super Mario 64 was that, and Sunshine, Galaxy and 3D World didn't rest on its laurels in the same way that the main Zelda games hemmed to the Ocarina of Time formula. Instead of sea change, we got another great Mario game. Controlling Mario in three dimensions has been fun for more than two decades, and with each iteration Nintendo hones its mascot a little more. I had as much fun jumping and somersaulting around in Odyssey as I did when I was 12 playing Mario 64. Yes, we got some important updates, like fast travel and maps, and a truly memorable mechanic in Cappy. But it's that core, that joy of Mario, that makes collecting 800 meaningless objects fun. It's the joy of Mario that makes Odyssey one of the best games I've ever played, and a firm contender for game of the year. Now the challenge for Nintendo is to meet the standards it set with Odyssey and Breath of the Wild over the coming years. And that's a good problem to have.